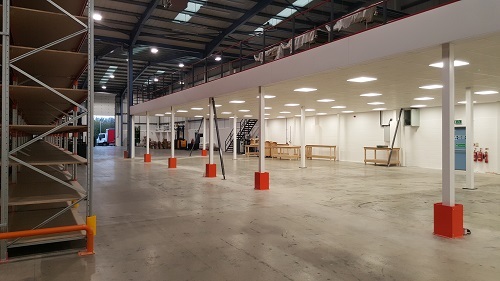 Warehouse Storage Solutions was invited to tender for a major new fit out for Prestigious Textiles involving Narrow Aisle Pallet Racking and a Mezzanine Floor to be fitted in Bradford. 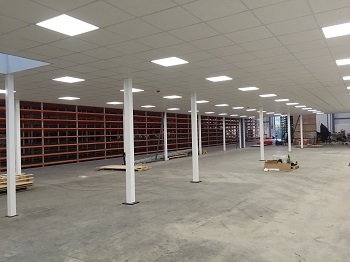 Due to the variety of the products that Prestigious Textiles store, the tender process involved working closely with the client to ensure that the racking specification suited their various products. 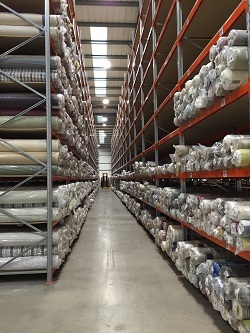 After a number of designs Prestigious Textiles awarded the contract to Warehouse Storage Solutions. 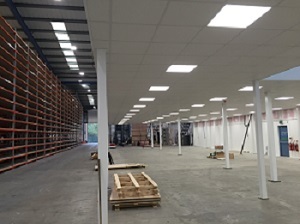 The warehouse has already been built and the client was looking at moving product from an existing warehouse into their new premises. 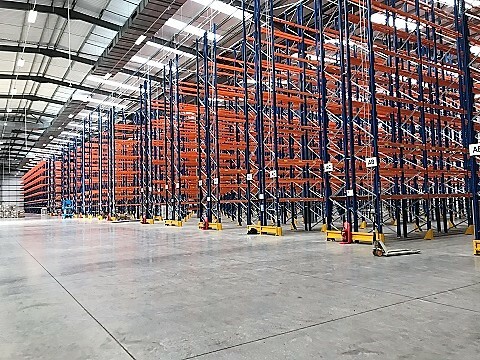 This meant that the racking had to be built in a manner that allowed for the handover of sections of the pallet racking to be loaded by the client. Warehouse Storage Solutions also worked closely with Prestigious Textiles and their automation supplier to ensure that the mezzanine floor was designed to accommodate the conveyors, lifts and workbenches. The placing of the mezzanine floor columns had to be precise to ensure that there were no clashes with the automation. With staff working on the mezzanine floor at all times the structure had to be fire rated. 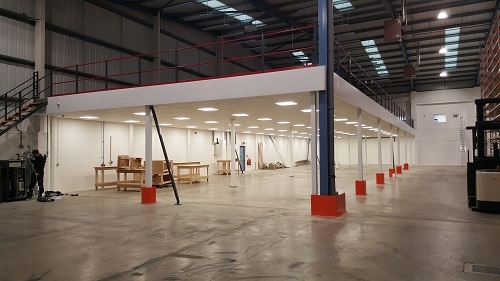 Warehouse Storage Solutions was also contracted to supply, deliver and install column guards and anti-collapse safety mesh as well as the pallet racking and mezzanine floor. 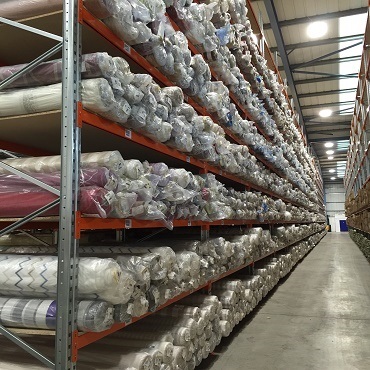 Due to continuous growth at Prestigious Textiles Ltd we started to plan to integrate our two main warehouses into one new warehouse that became available around September 2015. September – December is our busiest time of year and the pressure was on for us to install our new warehouse with enough pallets racking to house 100,000 rolls of cloth and to give us the room to grow by around 40%. We also had to organise a Large Mezzanine Floor to support and extend our modern specialised conveyor and packing system. Matthew Powell and his team at Warehouse Storage Solutions responded to our needs with great speed offering us the very best options on how to maximise our storage capacity but maintain a very safe, light and spacious warehouse and they offered us top quality products at very competitive prices. Matthew and his team expressed a very cool and professional style throughout the whole installation they fulfilled all our requirements with very little fuss especially considering what very little time we had to complete all works. I would highly recommend their expertise and efficiency.